Carriage Repair Workshop Mancheswar Bhubaneswar, Waltair Division and Khurda Road Division. Currently Trade Apprentice training or Apprenticeship program will be conducted in the different ITI trades of Welder (Gas & Electric), Fitter, MMTM, Machinist, Crane Operator, Painter, Electrician and COPA. Eligible candidates that is 10th or 10+2 qualified and ITI National trade certificate having candidates can apply online using www.rrcbbs.org.in website from 18-05-2017 to 17-06-2017 till 05:00 Pm. Selection for this Apprentices Recruitment of East Coast Railway is based on average marks in 10th class and ITI qualifications. 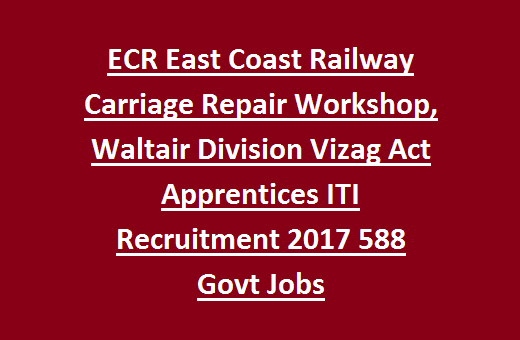 For more details regarding East Coast Railway Vacancies of Act Apprentices for Apprenticeship recruitment 2017 division wise vacancies, age limits, online submission process and more details are given below. 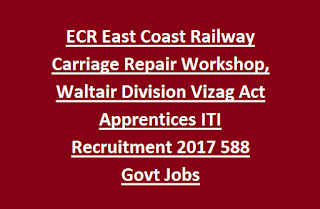 There are total 588 vacancies available in East Coast Railway ITI Apprenticeship Program. For trade wise vacancies of Act Apprentices refer official notification. Candidate must have completed 10th class or its equivalent under 10+2 stream of examination. And should have National Trade Certificate in relevant trade. As on 17-06-2017 candidates age limit should be in between 15-24 Years. Age relaxations are applicable for SC/ST 3 years and for OBC candidates 5 years upper age relaxation will be given and for PH candidates upto 10 years of upper age relaxation is given. As per the norms of ECR Railway Board. Application Fee Rs.100 to be paid online through internet banking, credit or debit card or using E wallets. No application fee for SC/ST/PH/Women candidates. Selection for this Apprentice Program will be held based on average marks in 10th class and ITI trade. A merit list will be prepared based on those marks and those are called for Apprenticeship Training. Online applications will be accepted through www.rrcbbs.org.in website of East Coast Railway. Closing date for submission of application form online is 17-June-2017. No need to send the physical copy of application to RRC.